Editor(s): Skillen, I.; Balcells, M.; Trager, S. C.
Large-scale spectroscopic surveys are essential to resolve some of the most profound questions confronting astronomers: How can the fossil record reveal the assembly history of the Milky Way? How do galaxies form and evolve? What is the nature and distribution of dark matter? Why is the expansion of the universe accelerating? Several ambitious multi-object spectrographs are in rapid development around the world, and in March 2015 the Isaac Newton Group invited the international community to a conference held in La Palma, Canary Islands, to bring together scientists who have played vital roles in developing and exploiting past generations of survey spectrographs and those planning the next-generation instruments and surveys. The aim was to encourage the exchange of experience and expertise, and to develop coherent strategies among the large survey teams. The conference attracted 149 delegates from 21 countries, and topics presented covered Galactic structure and archaeology, stellar evolution, galaxy evolution, cosmology, and new, state-of-the-art instruments. It concluded with a fruitful discussion on the challenges of developing, operating, and exploiting these new instruments and their surveys, and the opportunities enabled by anticipated advances in technology. 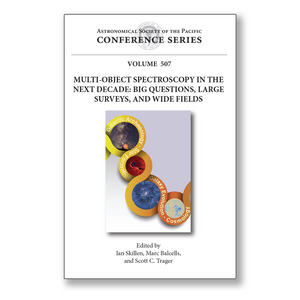 The papers in this volume provide an overview of the role and future directions of spectroscopic-survey science. As a record of the insights and aspirations of recognized world leaders in the field, it will be a valuable reference to multi-object spectroscopy for a considerable time to come. It will be of interest to students, astronomers, instrument builders, and funding agencies, as new instruments and surveys are conceived in the coming years.